Well, I can’t say that I’m not jealous. 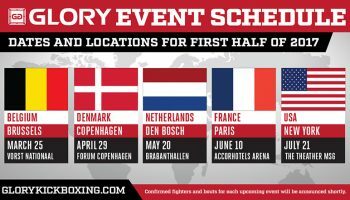 Chicago, the home of the MMA Nuts, will be getting one of the most anticipated fights in Kickboxing history in the way of the rematch between Australian powerhouse Nathan ‘Carnage’ Corbett against Blackzilian Tyrone Spong. These two guys met in 2009 in Montego Bay at Champions of Champions II where they went to a No Contest (part 1, part 2). The fight was marred with controversy when the referee gave Spong a standing 10-count after a huge right hand from Corbett. The ref pulled Spong up and it looked like the fight would go on, only for the ref to wave it off just as Carnage launching a huge attack against Spong, which led to the no contest. It would have absolutely been a knockout for Corbett otherwise and is the one blemish on his record since 2006. This is a huge, huge fight and should be wildly entertaining. On top of that Chicago gets the GLORY Heavyweight Tournament, which will crown a new GLORY Heavyweight Champion. The competition is between top ranked fighters Gokhan Saki, Daniel Ghita, Rico Verhoeven and Anderson “Braddock” Silva.